Racer and four time USAC Champion Bryan Clauson has died from injuries suffered at a midget race in Belleville, Kansas Saturday night. He was only twenty seven years old. The Noblesville, Indiana resident was in pursuit of starting a record two hundred races in 2016, including the 100th Running of the Indianapolis 500 in which he finished twenty third for Dale Coyne Racing. The Belleville Nationals race that became his last was number one hundred and sixteen out of two hundred. Characteristically, he was leading when the accident occurred. Some easily accomplished changes can save the fastest and in our opinion highest form of IndyCar competition, oval track racing. Neither difficult nor expensive to implement, these improvements should be made immediately for the sake of the sport. May God save open wheel oval racing, the closest thing to spectator heaven that exists upon this earth. Long time fans of IndyCar racing on ovals, we’ve consistently raised alarms at their steady erosion from the schedule. At first blush the very thought of bettering side by side racing at over 200 mph seems ludicrous, but it can be done and fairly easily so. There are a number of things IndyCar needs more of to attract fans to its oval events – and one less. Among those additions are more comfort and fun. The subtraction involves putting someone in charge who appreciates IndyCar’s heritage. 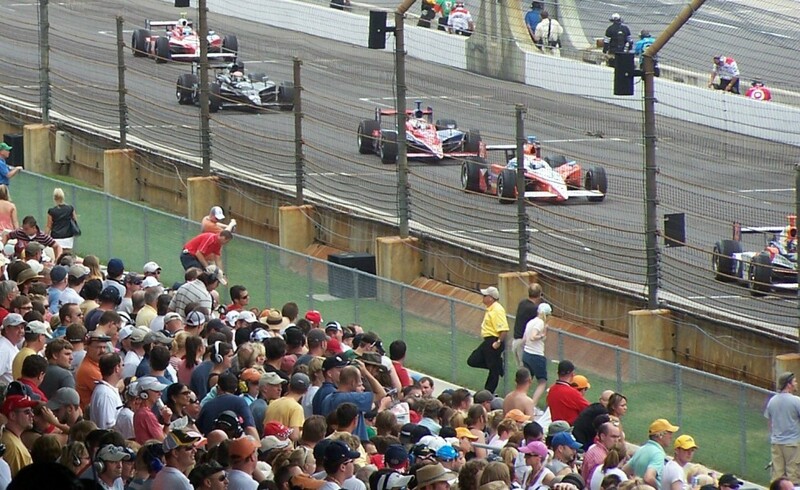 Auto racing’s most important race ever is mere days away, the 100th running of the Indy 500. A fixture at Indianapolis, one thing’s always certain: history will be made come Memorial Day Sunday. Our special 100th Indianapolis 500 prediction is a whole lot of yellow – the angular 100th 500 emblem, countless canary cars, hordes of yellow shirts and yes, also a goodly number of caution flags. In IndyCar, that means lots of twenty minute snack and bathroom breaks for the spectators. With six full fledged rookies, another who barely started the 500, several more Month of May one offs and Takuma Sato in the field there’s bound to be some crashing. As for nearly half the field being yellow liveried, despite the odds we’re predicting a non-yellow car to win. The normally rideless Rookie of the Year Gabby “Pat” Chaves found him/herself atop the speed charts on the fourth/third day of practice. This extreme oddity – in a Dale Coyne car, to boot! – continues a Honda sweep at the top of the charts. There’s a cautionary note or two that accompany this story, though. First, the speed was tow assisted. Plus, a third Honda engine blew up in as many days of practice, never a good sign. Ryan Hunter-Reay’s AA machine belched smoke rolling to a halt on the warm up lane during the afternoon session. After Spencer Pigot’s wreck in his yellow car Wednesday, the series was taking no chances. Perhaps they were being overly cautious, like last year. Either that, or an inordinate amount of debris somehow found its way onto the racing surface. Seemed like an awful lot of cautions Thursday, despite the happy absence of wrecks. The speeds were slower, too. Pigot still hasn’t made it back out in his RLL backup car, which he’d described as “bare.” Probably the cautious thing to do.